Traveling fills my imagination with new ideas. I’m still writing about stuff I saw after last month’s journey west. 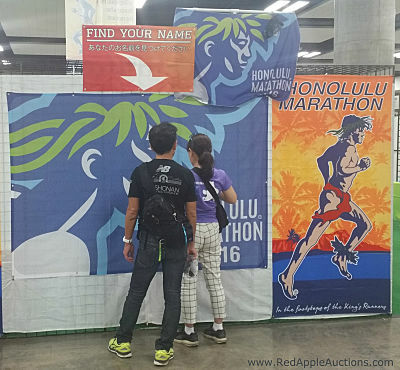 Before flying home after the fundraiser, I saw that the 2016 Honolulu Marathon — the 4th largest marathon in the United States — had a free trade show. The Hawaii Convention Center was just a short jaunt from my hotel, so I visited. Recall that I already wrote about how this trade show used a Graffiti Wall, which is an idea I’ve already seen used at a Florida benefit auction. But here’s an idea I’ve not yet observed at an auction: Find Your Name boards. The names of the nearly 22,000 marathon racers were alphabetically listed into the logo of the 2016 event. Racers stopped by the board to find their name and snap a photo. See how the logo had racers’ names designed into the logo itself? It was a popular spot to take a photo. Let’s consider two types of Find Your Name boards — one for guests and one for sponsors. Would this work to recognize guests. Here are three types of events that could pull this off. This year I’ll work three auctions that are part of an association conference. These types of benefit auctions are tricky for several reasons, but two advantages are their size and certainty of their attendee list. Though some onsite registration is to be expected, many of these types of events have a solid guest list in advance of the conference. Attendees travel near and far to attend their industry trade shows. Traveling requires planning; hotel rooms and airfare must be bought. The pre-planning required to attend an industry event helps my clients solidfy their guest lists. Plus, the gala fundraiser is often one of the final activities of the conference, which buys planners another day or two to print one of these Find Your Name boards. The planner can wait until the conference is underway before printing the board locally at FedExOffice and showcasing it at the gala. The board would feature the conference logo (see the photos) and — upon closer inspection — be comprised of conference attendees names. Many zoos have large fundraisers whereby 1,000 – 2,000 people attend and wander the zoo at night. If attendees are known in advance (such as via an online ticketing program), their names could be designed into a sign like this and featured on the grounds. Any large gala-style event drawing crowds of 1,000+ could use this idea, *if* the guests are known in advance. Would this work to recognize sponsors? Visibility at an event is often part of a sponsorship package. This board hides a company name within the larger event logo. Furthermore the design doesn’t allow for emphasis on any particular name; everyone is an equal on the board. Yet event sponsors usually contribute different amounts of money and may want to be recognized in proportion to their gift. Yes! In Hawaii, racers loved the name board. A steady stream of people lined up to find their name and pose for a photo. This concept would work in a benefit auction environment if you know your guest list in advance, and have enough people attending to support the logo design. If you’ve used this type of activity in your auction, please share how you’ve successfully incorporated it. Did guests like it? Was it ignored? Was it too much work for the outcome?